Mould can be found pretty much everywhere and is an essential part of our environment. It’s one of nature’s cleansers because it breaks down dead organic matter. It’s wonderfully effective when working in the outdoors, but when it gets indoors it can cause big problems. 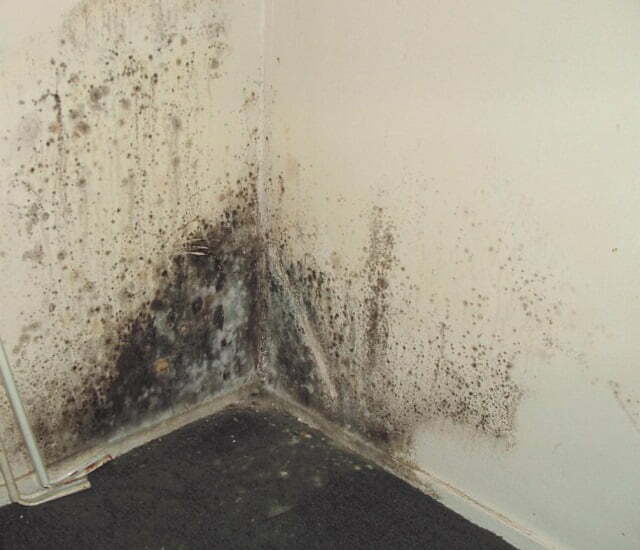 Mould is an organism that reproduces through tiny spores. The spores group together creating a single visible cluster, like what you see on old bread. Visible mould clusters means that there are airborne mould spores flying around. These spores are invisible to the human eye and pose significant health risks. For people who are sensitive to mould, it can cause respiratory problems, allergic reactions and in the worst cases taking root in the body. If you’ve found mould in your home, now is the time to get rid of it. As well as the health risks it poses, it’s also consuming the surface it’s on. It won’t go away by itself and will only get exponentially worse. Our comprehensive guide below shows you how to get rid of it from walls, floors, ceilings and other hard surfaces. As with pretty much all organisms, the key ingredient to mould is moisture. Without water, it can’t survive. You need to identify the source of the moisture and fix the issue. If you don’t, then even after you’ve completely cleaned away all the mould, you can be sure it’ll be back. External causes of excess moisture causing mould can be broken pipes, floods or a leaky roof. 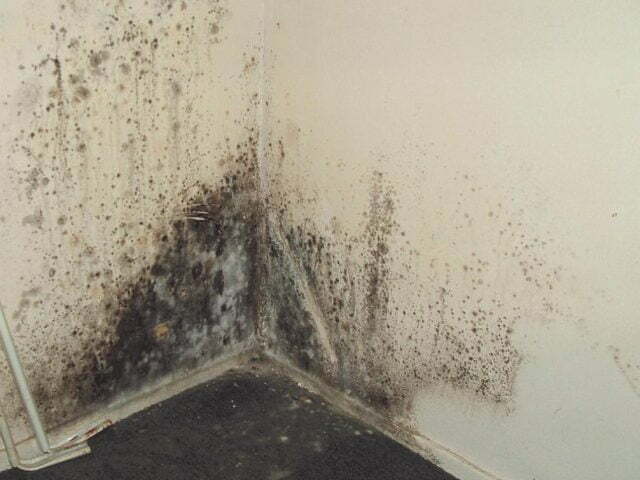 Internal causes of mould can be air drying of clothes, appliances like stoves, washing machines and dryers with no exhaust systems, overcrowded rooms (people produce moisture from breathing and sweating) and inadequate heating and cooling allowing water to condense on windows and walls. Mix the boric acid in with the water and hydrogen peroxide. You can use warm water from the tap which will help more of the boric acid to dissolve. Don’t use boiling water, warm water is fine. Plan to use all the mixture that you prepare. Hydrogen peroxide is light sensitive and will break down after about 4 hours. After that time the mixture won’t be as effective. 35% Hydrogen peroxide is the most common concentration found in stores. Other varieties are the 3% and 6%, but the concentrations are too low. You need to achieve about 10% Hydrogen Peroxide concentration. Put on your goggles, gloves and mask and fill your spray bottle with the mixture. Spray the boric acid mixture over the mould and importantly over surrounding areas. The mould will have spread further out, but won’t yet be visible to the naked eye. Be liberal with the application, but not to the point where it runs down the wall, pools on the floor, or drips from the ceiling. Allow it to soak in for a couple of minutes, and then apply again. Once re-applied, leave it for about 30 minutes to let the boric acid work its magic. Prepare the two buckets of the remaining boric acid mixture. The first bucket is for wetting your new cloths and the second is for washing the mould off the cloths. Microfibre cloths are great for cleaning mould because they have a slight electrostatic charge and are easier to get into tight spots than normal sponges. They’re also cheap, have a multitude of other uses and can be washed on a hot cycle with boric acid up to 100 times. Start off by dipping the cloth into the first bucket. Then wipe the mould in a circular motion with the microfibre cloth. Be sure to not spread the mould onto unaffected areas by wiping towards affected areas. Keep wiping until all the visible mould is removed. Rinse the cloth in the second bucket. Change cloths when it starts to look manky. Once all the visible mould has been removed, it’s now time to prepare the area for its main long term defence against mould. Spray a thin layer of the mixture over the treated and surrounding areas. As the mixture dries the boric acid will soak into porous surfaces providing a thorough barrier against mould. For non-porous surfaces, it leaves the thinnest of films of boric acid on top. To ensure the treated areas are properly dry, set up a fan in the room on its lowest setting to move the air about. Pedestal fans are best because they are taller and have the oscillation feature. Be sure to check the room weekly for any signs of a recurrence. Any new mould breakouts, if caught early, can be cleaned up with just a boric acid and water mixture. If you’ve not removed the source of the moisture, then once your weekly checks are clear you can switch to monthly. Do you have your own process for treating mould with boric acid? If you do,we’d love to read about it in the comments section below. You could try this guide, but it depends on the fabric of your blinds. The only thing you need to be careful of is that boric acid could bleach the fabic. Probably best do a small test first. I’d also suggest finding where the moisture is coming from. Mould loves moisture.